Kingdom Under Fire is getting a true sequel. Even though there are other games that share the same name, none have captured the original scale and strategy of Kingdom Under Fire: The Crusaders. Some new media has just popped up, and now the game has the full attention of this Co-Optimus writer. In a Gamespot interview from earlier this year, the game's executive producer answered some questions regarding this Action/RTS hybrid. 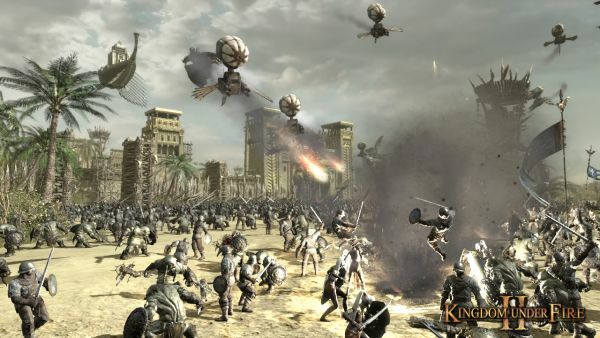 From the sound of it, the core of the game is based in real time strategy, with the ability to jump in and out of the action and have direct control of the battles. Kingdom Under Fire 2 promises to have co-op missions, though specifics aren't available just yet. The really unique thing about KuF2 will be it's giant persistent worlds that make the game almost MMO like. It's best left to the producer to explain. Numerous players will be able to maintain their presence in the online continent of Bersia. There are going to be more than 10 thousand players registered in each server, and players will be able to travel around the online world in something called a "mothership." The persistent online world will be rendered in full 3D, and on it you will see numerous ships flying and exploring. There are many cities in this world, and soon everyone will be engaged in territorial conquests. There will be guilds and factions that you can join, and you will partake in the campaign of territorial expansion for your group. In many different geographical locations, many types of battles will take place, including multiplayer field match, online co-op missions, and the all-new castle siege battle. We are preparing different types and sizes of battlefields: small ones for two-vs.-two and three-vs.-three, or huge maps to accommodate possibly a maximum of 15-vs.-15. The number of troops that can be assigned to each player will be determined by the size and type of map where the battle is fought. Based on the result, each player will be rewarded with items, war funds, and experience points. These small field battles are what make up the big war over the whole continent, and this is how guilds and factions will function and get involved in territorial conquests. Sounds quite ambitious, but also incredibly awesome. The official site is loaded with screenshots, and CVG has posted a few more. But to truly get a taste of the action and chaos the game has to offer, we recommend watching this trailer.